Dalat is a famous tourist city of our country. Speaking of Da Lat, visitors will probably think of many famous tourist destinations and not to mention the Tuyen Tam Lake Resort. So what to do in Tuyen Lam Lake? Do you know? Travel with Origin Vietnam Travel to find out more information about it. Tuyen Lam Lake was built from 1982 to 1987, originally named Quang Trung Lake. It's one of the 21 national tourist sites in Vietnam, located in Da Lat city, Lam Dong province. Tuyen Lam Lake is also the largest freshwater lake of Dalat with an area of ​​320ha, located 7km from the center of Da Lat city. From the center of Dalat City, visitors can easily move to this tourist destination by motorbike or car. What to do in Tuyen Lam Lake? Are there any interesting at Tuyen Lam Lake? This is probably the question that visitors want to find the answer most, right? Tuyen Lam Lake Tourist Resort is an ideal destination for travelers to spend their time exploring. So let's see what's special about this place. Dalat is famous as a foggy city with poetic beauty, majestic and very romantic. 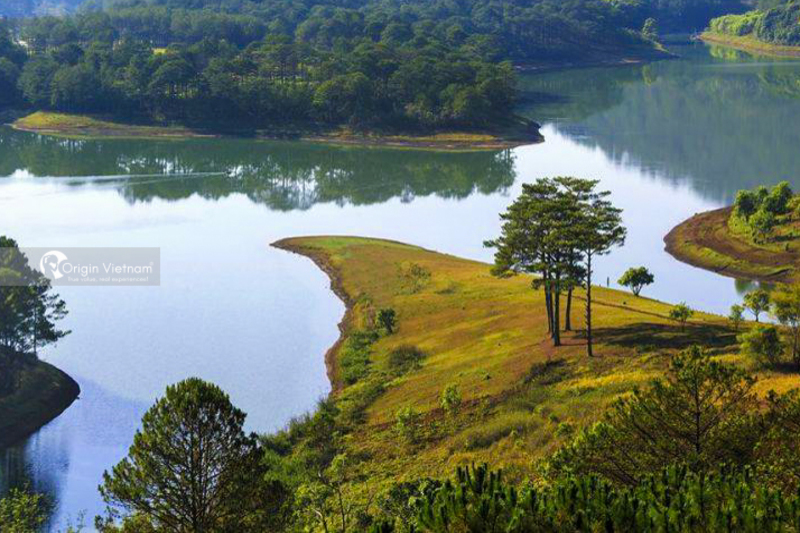 And Tuyen Lam Lake is one of the highlights that make a very romantic, romantic Da Lat. Tuyen Lam Lake, surrounded by green pine forests, gives visitors a peaceful feeling. Coming to Tuyen Lam Lake, visitors can confidently drop their soul into the natural setting and temporarily forget all the worries of life. In order to enjoy the beautiful scenery of Tuyen Lam Lake, visitors can choose to take a boat trip to admire Tuyen Lam Lake. 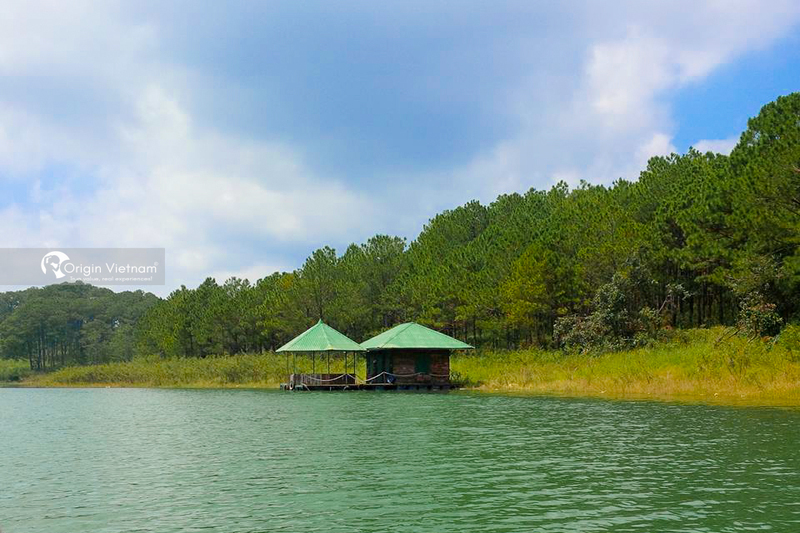 Tourists traveling self-sufficient or follow the Dalat tour one day can participate in boat service on the lake. Guests can take part in the boat cruise on Tuyen Lam Lake, which can also combine with some interesting experiences. Such as picking strawberries and seeing the maple leaves. With this experience, visitors will surely be memorable. - According to Origin Vietnam Travel, travelers while traveling to Tuyen Lam Lake, the best tourists should choose the morning or afternoon. This is the time frame for Tuyen Lam Lake to have the most beautiful scenery of the day. Also quite convenient for visitors to play games experience here. - About dining in Tuyen Lam Lake, you can find restaurants, restaurants around the lake to eat. If you travel to Da Lat 2 days by your self. You can prepare more food to have a picnic or camping on lake side. - Near beauty spot in Tuyen Lam Lake. There are many interesting and attractive tourist attractions waiting to be explored. Truc Lam Meditation Center is one of the destinations not to be missed when visitors have the opportunity to visit Tuyen Lam Lake. This is not only the largest monastery in Lam Dong. But also a sacred destination that many visitors want to come and pray. To be able to visit more attractive tourist spots near Tuyen Lam Lake. The better way you should make a travel plan so that they can visit many tourist sites without having to miss. And also save a lot of time on your trip. 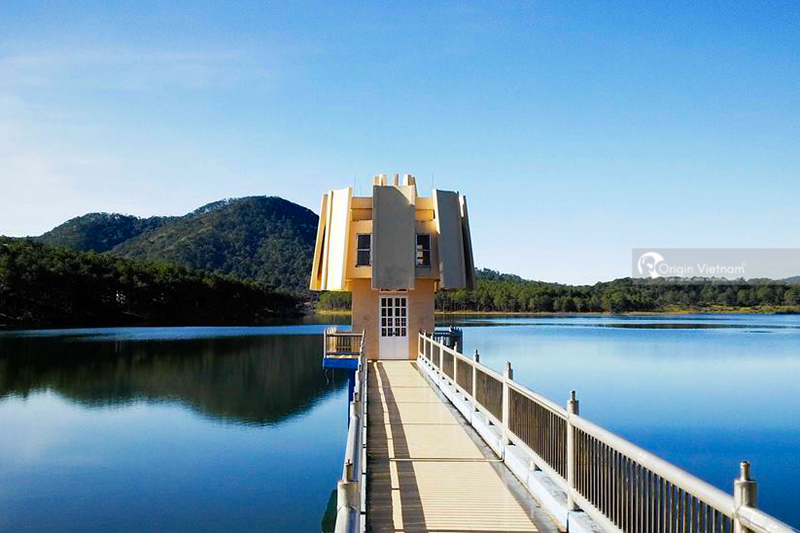 Tuyen Lam Lake is one of the factors contributing to the romantic of Dalat. The above is the sharing of Origin Vietnam Travel for visitors on " What is Tuyen Lam playing? Do you know? " Hopefully through this article visitor will know more about this attractive beautiful sports as well as will give visitors much inspiration to start an interesting trip to Dalat in the coming time. Origin Vietnam Travel is always ready to welcome inquiries and share from visitors. Wish you have a great trip to Dalat to discover Tuyen Lam lake.